Besides sewing I also enjoy a spot of knitting. 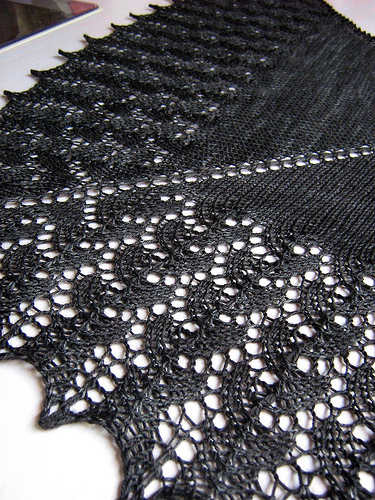 I caught the lace knitting bug about a year ago, and have since knitted several shawls including Laminaria by Elizabeth Freeman, Shetland Triangle and Swallowtail Shawl both by Evelyn Clark. Ishbel by Ysolda Teague was a joy to knit, the charts were easy to read, and the knitting was rather easy. 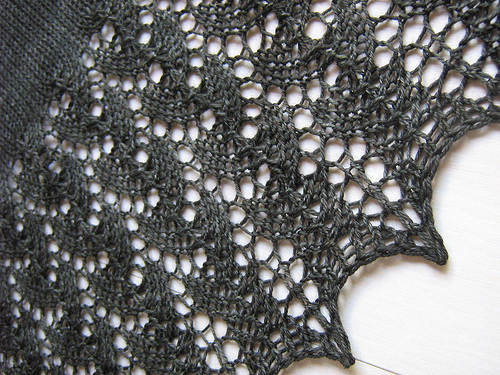 Lace knitting looks far more complicated than what it actually is. The same can be said for reading the lace knitting charts. Although a level of concentration is required the process is simple if taken one step at a time. I have used Malabrigo Sock yarn for this project in the colorway Alcaucil. It is a soft merino yarn which has been kettle dyed to give it a deep rich color with subtle shadings. Ishbel was a quick knit and will be found by a family member in a Christmas stocking soon! 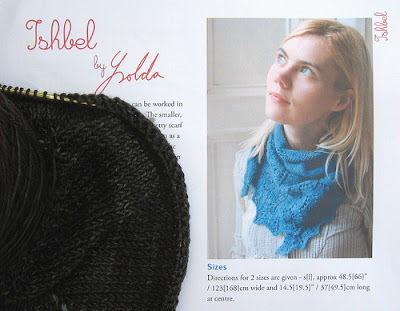 Ishbel, the pattern, can be found here. My finished knitting projects can be seen on Ravelry. 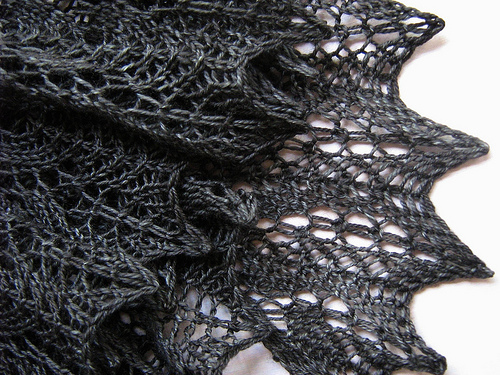 I too indulge in knitting - lace knitting but just managed a shawl for myself using a 'simple' lace pattern. Just need a few more rounds for the knitted socks (since two months back)but the quilting bug hit again. Wow! That's beautiful!!! So delicate and pretty. I love to knit too, but I haven't done any lace knitting -- it scares me a bit! Do you ever sleep??? I can't believe how many fo's youo have on ravelry on top of all the quilts you make. I am amazed and envious of your talent! yeah, right: do you ever sleep?? you are killing me - this is gorgeous!! and i love the color as well..
i have to try that, thanks for reminding/inspiring! A lovely shawl - beautiful! Guess I need to find someone local who has Shot Cottons so I can see them in person! Wow what generous stocking stuffer you are! Someone must have been very good this year! I'm only willing to put felted wool slippers in the stocking! umm can I be your family member and find it in my stocking? haha it is beautiful!!! And I also ask that question, do you sleep? So many quilts cover our house and knitting in between that. I love it! I can't imagine how you could call such a thing a "quick knit"! Do you have the secret to a 27 hour day? Honestly, I pick myself up off the floor a lot when I'm at your place. Ishbel is beautiful and I must dash off quick, because there are a kazillion things to be done before I head off in that sort of direction again. Gulp. Oh, Rita! Your Ishbel is awesome! What a gorgeous color too! Beautiful job. I briefly worked on a beginner lace project. :-) Now with Ishbel envy, I may have to try, try again.